An exclusive report from a confidential highly-placed Israeli source says that a booby-trapped drone crashed and exploded at the top-secret Israeli airbase Sdot Micha. 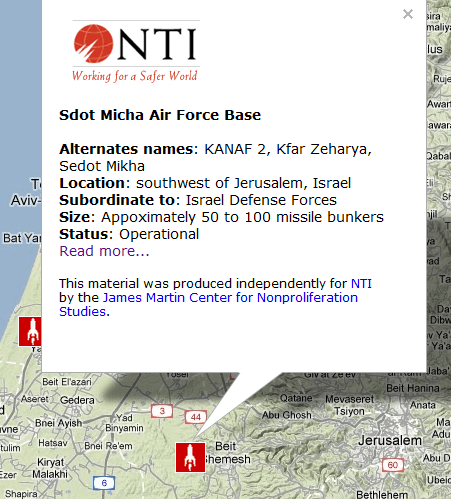 Sdot Micha (also profiled here) is the home of the Israeli missile arsenal including its long-range Jerichos capable of striking Iran. There were civilian and military eyewitnesses to the crash, which happened within the perimeter fence of the facility, which covers a large area just outside Bet Shemesh. The eyewitnesses and Israel’s wish to avoid pressure to retaliate against the Iranians, necessitated the publication of a media cover story. The story claims an advanced Israeli drone crashed near the Yesodot moshav, 10 miles from Sdot Micha. Israel also claims the drone took off from Tel Nof airbase. Eyewitnesses may be able to produce video documentation of the precise location of the crash unless it is impounded by the IDF. The cover story reminds me in crucial ways of a similar one put out by the U.S. when it lost control of its advanced drone inside Iran. It did everything in its power to make the world believe that the drone crashed by accident and we vehemently denied it was brought down by Iranian electronic warfare capability. The more we denied the more people believed we were protesting too much. Though crashing a drone inside Israel would appear to have Iran’s fingerprints all over it (they would certainly have greatest motivation), it’s hard to believe that Iran could fly a drone 1,000 miles with such precision. So blame will inevitably fall upon Hezbollah, a Syrian-Iranian ally, which often procures its most advanced weaponry from Iran. Hezbollah would’ve launched the drone from southern Lebanon. But I find it unlikely it could master the technological know-how to bring this off without Iranian engineering assistance. There were no Israeli casualties and the drone explosion caused no significant damage at the base. But the very fact that Iran or its allies have escalated the psychological war of nerves in such a fashion will raise the temperature inside Israel once the true story is known. It will confirm among the hawks like Bibi, Barak and Bogie Yaalon the imperative to attack Iran. And the average Israeli man in the street will be that much more accepting of war given this new level of threat. But the “beauty” (if such a phrase is appropriate) of a drone attack is that, like the Mossad assassination of nuclear scientists, it’s hard to figure out precisely who is to blame for the attack. In that sense, it raises the temperature, but does so in a carefully calibrated way. The fact that Israel could not detect such a threat and stop it before it did its damage indicates also some gaps in Israel’s defensive systems. Admittedly, drones are hard to defend against and Iran/Hezbollah may not have many at their disposal. But they clearly can do significant damage as we’ve seen from U.S. drone strikes in Pakistan. Imagine a drone equipped with a warhead (the current one appeared only to be booby-trapped, but not equipped with a warhead or missile) taking aim at the Kirya? That, of course, would be the next stage of development and one Israel might expect in the not too distant future. Certainly, a far more sophisticated step than merely crashing a drone into an airbase. But by no means beyond the realm of possibility for Iranian engineers at some point. I have always argued that there is a price to pay for Israel’s black ops campaign against Iran. In this case, the price was very low. But it will not always be so. There’s always a price to pay. The only question is when you’ll have to pay and how much.